I have IIS 7 set up with the 'Default Website' intact at port 80, and I have added a handful of other websites parallel to it under 'Sites', all running on different ports. I'd like to move these sites to exist as sub applications of the Default Website (ie: all running on port 80, reachable as ../SiteA ../SiteB), while maintaining their current configurations. I could just remove them and re-create them, but I'd like to maintain their configurations. 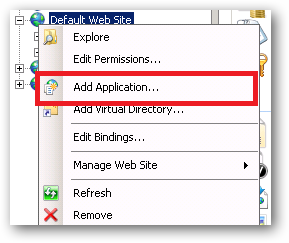 For clarification - I have existing sites created in IIS, configured within IIS - I don't want to delete them and re-create them by adding them to Default Web Site as sub applications from scratch. I'm wondering if there is a way to literally move the existing applications along with their configurations (Meaning I have Mime types, Authentication rules, Bindings, and other custom settings I don't want to re-create if I can avoid it). To be even more specific, I had thought I might be able to click and drag one of the sites here ONTO 'Default Web Site' effectively relocating it as a sub application. If this is not supported functionality that's fine, I just wanted to explore the possibility of support for this kind of thing. Now depending on how you've secured the physical folders for SiteA, SiteB and SiteC, you may need to adjust the NTFS permissions to allow the Application Pool identity for whichever application pool will host these sites. 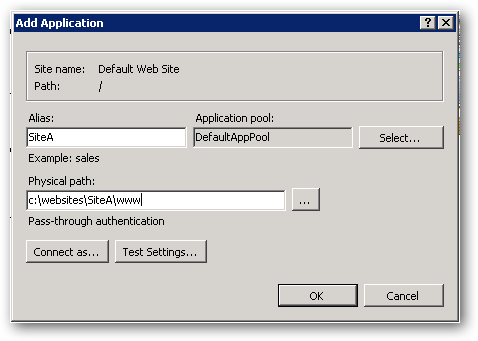 You could just re-use the pools that exist already for SiteA, SiteB and SiteC by clicking Select next to the Application Pool greyed out textbox. I had thought I might be able to click and drag one of the sites here ONTO 'Default Web Site' effectively relocating it as a sub application. Unfortunately IIS MMC doesn't have that capability, this is something you need to do by hand and it can be done with some careful copy, pasting and tweaking of settings in IIS7's applicationHost.config file. 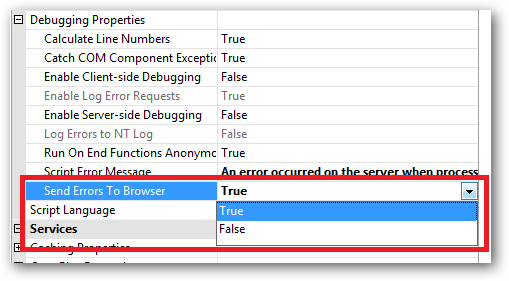 If most of the settings were configured via the IIS MMC UI using the Mime, Default Document, Error Pages etc features then these settings will be persisted in your sites web.config files under <system.webServer>. If this is the case then there isn't much you need to do. Click on "View by Schema" in the right hand panel which will show the hierarchy of settings. A site is defined in the <sites> collection which contains as you might guess a collection of <site> elements. There are a few settings that are children of a <site> element that make no sense residing anywhere else, for example the <bindings> collection which specifies the site IP address, host headers, port to listen on etc. When configuring site features via the MMC UI, the way a setting is persisted (whether it is saved in the local site web.config file or stored in the applicationHost.config file is generally controlled by how feature delegation for that setting is configured. In a nutshell anything that is set to Read Only will have it's configuration settings locked and can only be configured/saved in the applicationHost.config file. Any feature that is delegated as Read/Write or Configuration Read/Write will be saved in the site or sub application's web.config file. ...and you specified ApplicationHost.config <location path="SiteA" /> then the setting will be configured back in the applicationHost.config file regardless of the delegation setting for that feature. 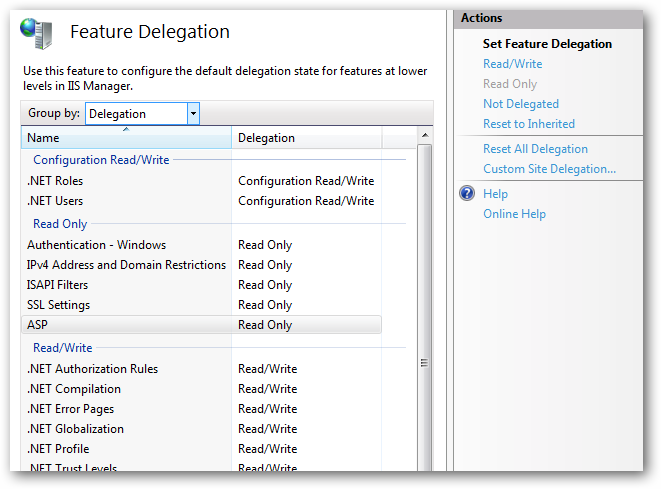 This hopefully explains where you can expect to find your settings based on interpreting the Feature Delegation rules. Non-delegated feature settings that can be controlled on a per site or application basis are stored in <location> configuration elements in the applicationHost.config file. These behave much like the <location> element in ASP.NET. Here's a worked example using the classic ASP settings. Classic ASP settings by default aren't delegated (the Delegation setting is set to Read Only in the Feature Delegation tool. You'll probably need to skip to the end of the file to locate this. Doing this should work for 99% of cases and without knowing your exact configuration it'd be hard to speculate on the 1% where some special attention is needed. If you're working in a 64 bit environment then you'll need to use a tool like Notepad2 which has a 64 bit version to be able to edit and save the applicationHost.config file. You also need to "Run As Administrator" as well when performing these operations. Not the answer you're looking for? Browse other questions tagged iis iis-7 or ask your own question. 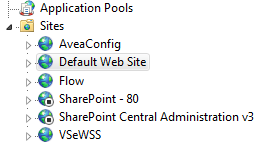 Are there any issues with having multiple IIS websites pointing at the same folder? Creating a test site for a current IIS site? Automated IIS backups at the application level? Is it ok to have lots of sites in IIS?